The Story of the "Bexhill 100 Festival of Motoring"
I have been asked to write this article, to commemorate the 20th Anniversary of the first Bexhill 100 Festival of Motoring in 1990, and I have done so as a tribute to all those people and organisations, helpers, marshals, sponsors, caterers, exhibitors, emergency services, Clubs, Council Officers, charities, entertainers and of course vehicle entrants, etc who helped make The Bexhill 100 such a memorable and successful event for 13 years. 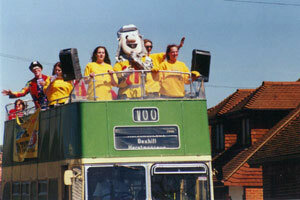 The Bexhill 100 Festival started life as a hopeful, fanciful idea and became a passionate adventure. It all began in late 1989- early 1990 with a set of chance coincidences, as these things so often do. Derek Smith, a likeable chap with a marketing background, came to Bexhill for a job interview with Rother District Council Tourism Director David Blake, for the post of "Tourism Officer". After his first interview, which apparently went rather well, Derek decided to find out more about Bexhill, its residents and its history. He asked a few questions around the town, did some research about local people and as chance would have it, he had heard from various people in Bexhill that I had been involved with marketing, advertising, exhibitions, hospitality and events over a number of years. It was just prior to his final interview with David Blake that Derek came to see me and have a chat over a coffee, in the restaurant on Bexhill seafront that my family had run for several years. During our conversation he asked me whether, if he was successful in getting the job with the Council, I would be interested in helping him with an event. I thought about it and tentatively agreed, never realising what I was getting myself into, and where it would eventually lead, and how it would completely take over my life for the next 13 years and the lives of all the organising team, the wonderful helpers and marshals and their families. After we had been chatting for quite some time Derek looked at me, and said "I am sure that we have met before". It transpired that a few years earlier, when I was a Director of an Advertising, Conference and Exhibition Company we had met at "The Griffin" public house near Charing Cross station. The Griffin was used as a meeting place every month for The Monday Club organised by Rob Spalding, editor of The Conference & Exhibition Magazine. Derek at the time was working for an Eastern airline in their marketing department. What "a small world". After talking nostalgically about old times, Derek left our meeting saying that he would keep in touch. He was duly offered the job with the Council, and true to his word, came to see me again and asked whether there was any history in the town that could be the basis of an event. I suggested he should have a chat with Brian Hazell who had an established Estate Agency on the seafront, almost adjacent to our restaurant. Over the previous couple of years I had got to know Brian Hazell quite well and I knew that he had a keen interest in local history and photography. He had moved to Bexhill from Byfleet in Surrey close to the famous Brooklands Racing circuit, and was consequently keen on motoring history. Brian had several times mentioned to me that there had been Motor Races in Bexhill, on the sea front, at the turn of the Century. There was plenty of evidence of these early races in our local museum, and he had located several books in order to learn more about this glimpse of Bexhill's fascinating past. Malcolm Mitcheson had decided to hold two dinner functions to introduce the first phase of the newly converted "Sackville" flats to the dignitaries, residents and businesses of Bexhill. At the first of these two dinners Brian Hazell, by chance, was seated next to Derek Smith, who was now Bexhill's Tourism Officer. During the evening their conversation naturally touched on Bexhill's motoring history and fancifully, they discussed how wonderful it would be if those early days of motor racing, on Bexhill's tranquil seafront, could be re-enacted as a modern event. From these first casual meetings between Derek, Brian Hazell and myself, things started to move at a quite a pace. After some hasty but intensive research it appeared that Bexhill was one of the first places in Great Britain to ever hold a motor race meeting, just after the turn of the century. It could even have been the first, which would unbelievably make it The Birthplace of British Motor Racing in 1902. The Sackville Hotel was the reason we named the festival "The Bexhill 100". We had several meetings to decide what to call the event, and Derek mentioned calling it a name similar to "The Indianapolis 500" We toyed with various ideas and we realised that this first proposed motoring festival that we were organising, was happening exactly 100 years after the Sackville Hotel first opened its doors to the public as an hotel in 1890. So what better than "The Bexhill 100 Festival of Motoring" We also tried in this first year, rather naively and unsuccessfully, to attract at least one vehicle from each of those 100 years to this first event. We started to publicise these dubious historic claims in various newspaper and magazine articles. 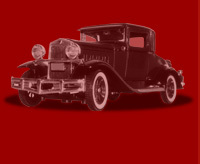 They were hotly disputed by the motoring experts, Bill Boddy for one, an eminent motoring journalist. He dismissed the whole idea in an article in several leading motoring magazines calling the idea "simply ridiculous". We were not deterred, we went out on a limb and began to think about organising an event with a motoring theme. All the while Brian Hazell was toiling away, finding out more information and more archive photographs of Bexhill's motoring history. Although Derek had marketing experience, and I had quite a few years experience, of organising events, we did not have the necessary contacts in the world of veteran, vintage and classic motors. Fortunately, about 10miles from Bexhill, there lived the ideal person, Paul Foulkes-Halbard. He was the owner of Filching Manor, a magnificent historical manor house and Motor Museum, which included a superb "Campbell Collection". We had several very fruitful meetings with Paul at the Manor, he was genuinely excited by the prospect of an event, virtually on his door step, giving him the chance to show some of his wonderful cars being actually driven on Bexhill sea-front, and to be involved with what may turn out to be a celebration of a unique historic motoring event. Paul, at this time was having new brochures designed for his Motor Museum and he was using a local chap, Keith Wallace, a talented artist and a very friendly bubbly character. 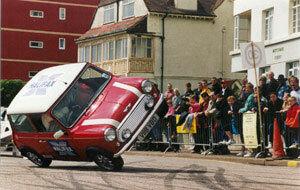 It seemed appropriate that we should use his talents for the Bexhill motoring event that we were about to organise. Keith in fact designed the now famous Bexhill 100 "winged logo". He also went on to design various other aspects of our publicity and marketing literature. His daughter was a professional photographer and we used her considerable talents to record the first Bexhill 100 for posterity, in fact many of the photographs accompanying this article were taken by her. One of Keith's contacts was Shelagh Milligan, the wife of "Spike" Milligan, who lived not far from Bexhill in Udimore near Rye. We decided to involve Shelagh with our planned event and to use her links and contacts with personalities from "Show Biz." We also involved, from the beginning, local cabinet maker, carpenter and builder, Ken Pope for his practical expertise and local contacts, and who, over the thirteen years that the Bexhill 100 existed, toiled tirelessly each year planning the layout and positioning of all of the marquees, stands and displays and utilities which filled the mile of seafront from the Sailing Club to the top of Galley Hill, named De la Warr Parade. As our event grew over the years, it also included the very large grassed area at Sutton Place, where the original Bexhill Golf Club course was until just before the second World war. You can still see evidence of the bunkers if you look closely. As we continued to immerse ourselves in the feasibility study of organising such an event, Derek, with his usual charm, had persuaded David Blake to support the event with some of Rother District Councils Advertising Budget. David being the lovely man that he was, excellent at his job, and passionate about promoting Bexhill and the De la Warr Pavilion, agreed. 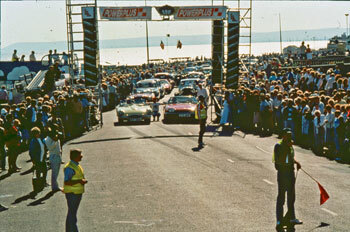 We had by now established, with certainty, by the early part of 1990 that motor racing had definitely taken place on Bexhill seafront on the May Bank Holiday in 1902 on the private road owned by Earl De la Warr. Several books had recorded comments from those present at the time, including John Montague MP father of the present Lord Montague of Beaulieu, indicating that Bexhill may well have been the Birthplace of British Motor Racing in 1902. 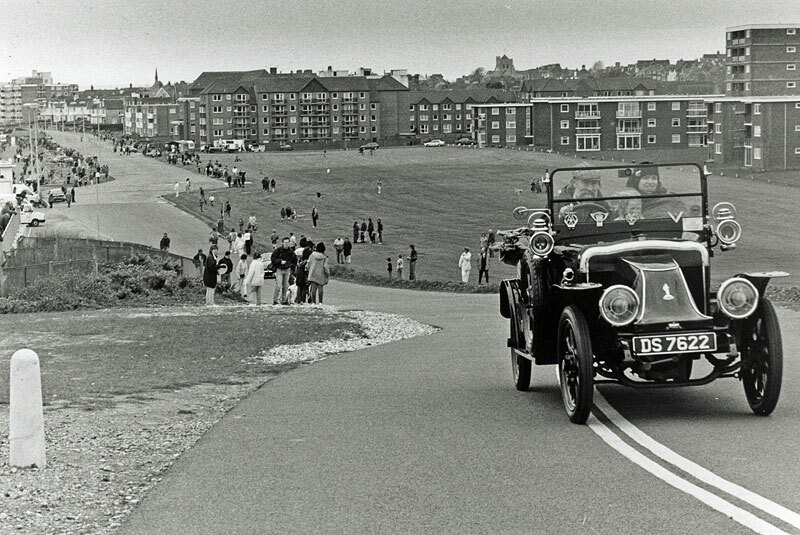 He in fact had stated in one of his books that "British Motor Racing started at Bexhill-on-Sea"
Having gone this far, and with some finances in place, we took a deep breath and decided to go ahead and organise a "Motoring Festival". So the huge task was on to arrange an event in just 13 weeks, the time that was left until the First May Bank Holiday of 1990, the same month that Bexhill hosted the Motor Races in 1902. The original races in 1902 took place over the Spring Bank Holiday at the end of May, the May Day Bank Holiday did not exist in those days. We decided to hold it on the first Bank Holiday in May because it is a well known that the Spring Bank Holiday is very often notoriously wet in Bexhill, when the traditional Bexhill Horse Show takes place. We obviously made the right decision because I think that in the 13 years, we only had one rainy day and then only in the morning. In the first year, we managed to exploit our seemingly slightly eccentric claim to fame and achieve plenty of press coverage by pulling various zany PR stunts. 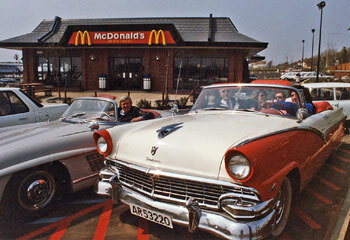 A McDonalds restaurant was about to open at the newly built Retail Park on the outskirts of Bexhill. We, together with Filching Manor Motor Museum, organised a cavalcade of American cars for the opening, filled with dignitaries and local celebrities, and we also had a few old Bentleys and Rolls Royce's, just for good measure. 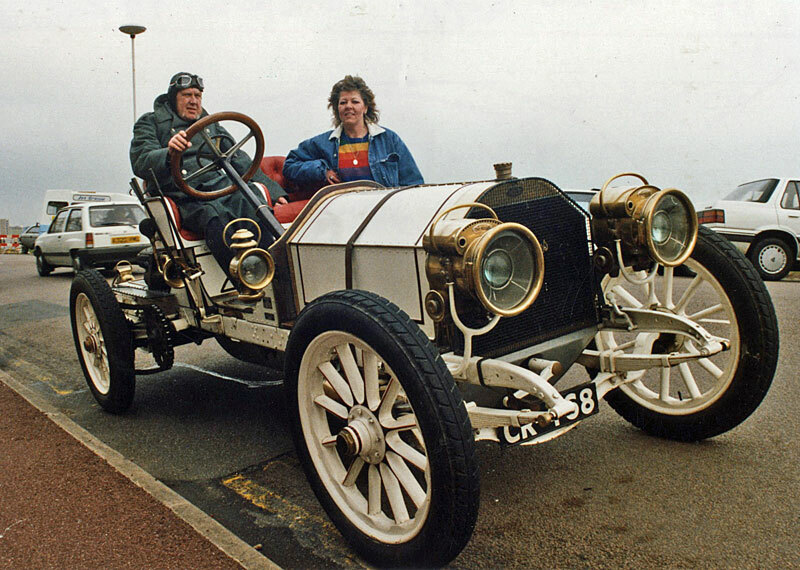 We had Filching Manor's wonderful 1904 open top Mercedes Racer, and several other stunning cars from the collection, buzzing along the seafront to Galley Hill, where in 1902 the cars gathered in pairs to begin their race along the measured kilometre. In fact for the thirteen year duration of the show, McDonalds generously supplied burgers and chips free of charge to the large number of enthusiastic Air Cadets who marshalled our car parks so superbly at St Richards School and the Glyne Gap Field. 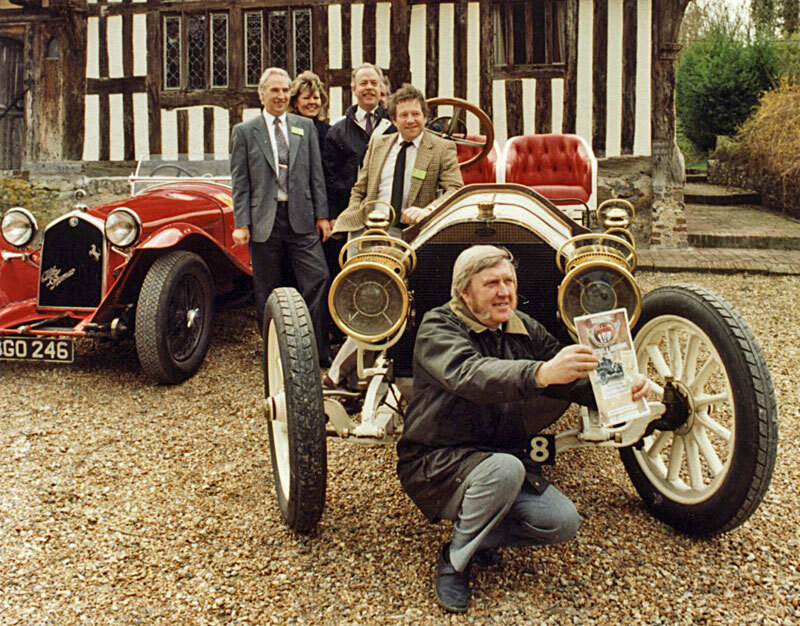 We organised several photo shoots using various cars and personalities to publicise this event and the forthcoming Festival. We badgered all the local radio and TV stations for interviews to advertise the festival and to boast about Bexhill's motoring history. We followed this up with a wonderful press launch at Filching Manor to announce the event to the wider public. Food was supplied from my family restaurant- 3 pretty waitresses dressed in 1930's Nippy costumes- a 1920's style jazz band playing in the Minstrel Gallery of the Manor House and a host of beautiful vintage and veteran cars in the grounds. We were pleased and excited to welcome so many enthusiastic members of the local and national motoring press, on a glorious sunny day, to Filching Manor. The next thirteen weeks galloped by, Brian Hazell's back office was a hive of activity, processing all the enquiries and the motoring entry forms. Brian's wife, Irene and his secretary, Tracy Trimmer toiled away with the huge piles of correspondence. The telephone never stopped ringing. Brian Hazell was so caught up in the excitement of it all that he never once complained at the disruption to his office, which was sometimes chaotic, but they were such exciting energising times. There was so much to do and so little time, organising marquees, entertainment, gantries, dignitaries, overnight security teams, sound systems, catering, generators, banners, signage, all the various elements of an event. We all had our own individual tasks within the organisation whilst at the same time trying to still run our various businesses. The weeks just flew by, and all the time we were arranging zany publicity stunts. We needed something extra to give this inaugural event a glamorous, exciting appeal and a reason for people to come to a previously unheralded celebration in a sleepy Sussex coastal town. Through Shelagh Milligan's contacts we managed, at some expense, to invite some sporting and television celebrities to come to the event. The outcome of this expensive outlay will be explained later. Ken Pope was working on the practical side of the event, locating maps of the event ground site, positioning the stands and the marquees, organising stakes and ropes and barriers etc. I was putting articles in various motoring magazines to attract entrants. Paul was contacting the Veteran Car Club, Brian Hazell was using his office facilities to collate all the entrants etc. I was co-ordinating all the various elements of the event, communicating with Rother District Council, making sure all details of the side shows, stalls, caterers and entertainers were being catalogued and included in our plans and all details of the event were kept updated. It was a whirl of activity, exciting but a little daunting. The weeks just flew by and suddenly, the weekend of the event was upon us. The show opened on the Sunday, for what we called at this first event, "Pit and Paddock" day- a sort of "warm up" tester day to make sure all of our preparations and plans were adequate for the main event and to be able to tweak any that we felt were a little shaky. The morning dawned - the sun shone and the people and cars, just as if by magic, arrived. Hundreds of vehicles appeared, and an estimated crowd of 25,000-30,000 people, about the same number that attended that first meeting in 1902. The promenade was littered with Marquees and motoring exhibits, clowns, bands and individual musicians were in evidence. Derek and I took turns on the microphone, as well as all of our other duties, Brian Hazell was busy recording the cars, Ken was sorting out the stands, electricity and water etc. Keith and Shelagh were doing radio and TV interviews, Paul was organising the vehicles for all of the specially invited guests. Paul was a notoriously bad "time keeper" and his eccentricity often gave us quite a few worrying moments over that first festival and all the subsequent years of the Festival, but we got used to his eccentricity, it was all part of his endearing character. We had been blessed with absolutely glorious weather for that first festival weekend - it could have been the South of France, the sea was calm and blue, the sun was warm and the atmosphere was really Continental, Bexhill had seen nothing like it for 88 years, not since those heady days in 1902. The owner of an established Cafe and Ice cream Kiosk on Bexhill seafront near to the Sailing Club came up to me early on the Sunday morning of the first event, furious with me that I had allowed catering units on to the seafront on a Bank Holiday Weekend. I tried to calm him down and promised him that if he did not take double his normal amount of money over the weekend I personally would make up the difference. At 3pm on the Sunday afternoon he had completely run out of stock and had to close. In subsequent years he learned from this lesson, he stocked up with extra supplies, arranged for extra deliveries and employed more staff and realised that this new event was good for his business and those of other Bexhill traders. On the Sunday evening a fund raising gala dinner was arranged at The Sackville by Mr. Malcolm Mitcheson, the freeholder of the building, which at this time was completely clad in scaffolding, as had been mentioned earlier in the process of a total refurbishment and conversion, from an hotel into service flats, a restaurant and a banqueting suite under his guidance. These Sunday evening Dinner & Dance functions, with guest speakers and dignitaries became a regular feature of the Bexhill 100 Weekend and continued for the life of event. In fact four functions a year were held which raised a great deal of money for charities, especially the Royal Air Force Benevolent Fund, and to support the Bexhill 100. Having enjoyed a wonderful Pit & Paddock day on the Sunday, and wined and dined at the Sackville Dinner on Sunday evening, we excitedly rose very early for the Bank Holiday Monday, the atmosphere was incredible, crowds of people, hundreds of vehicles and the roar of the crowd was amazing as the celebrities arrived on board a variety of vintage and veteran vehicles. Actress Barbara Windsor, World Boxing Champion Barry McGuigan, Ex-Goon Spike Milligan, Snooker commentator "Whispering" Ted Lowe, Actor Brian Murphy from TV show Bread, and others, arrived to huge cheers, with people surging forward to shake their hands and to get autographs. Derek was in his element meeting and greeting these high profile celebrities. Jacky Crouch, the manageress of our family's restaurant had been up all night preparing the food for all the special guests and dignitaries which she then served in our organisers' marquee. Mr Maurice Bell, the Mayor of Bexhill that year arrived on his treasured "World War 2" army motor cycle, to the delight of the crowds. To our amazement an old "battleship grey" pre-war coach turned up from Sweden, with the driver, conductor and passengers dressed in period costumes, it was certainly a day full of surprises. In later years it was a common occurrence for vehicles to come to the Bexhill 100 from the Continent. To our amazement an old battleship grey pre-war coach turned up from Sweden, with the driver, conductor and passengers dressed in period costumes, it was certainly a day full of surprises. 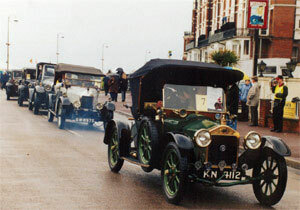 In later years it was a common occurrence for vehicles to come to the Bexhill 100 from the Continent. It was an amazing feeling to stand on the top of the old open top South Down Double Decker bus which acted as our commentary point, and view the event. We were absolutely thrilled, delighted, surprised, relieved and very proud. I am sure that we all had tears in our eyes. Vehicles from all years and genres kept arriving, vintage, veteran, classic, commercial, military, and quirky. All the drivers had huge smiles on their faces, as if they knew they part of something special, it is as if they knew they were coming home, to The Birthplace of British Motor Racing. Bexhill seafront was alive with wonderful vehicles, smiling faces and the throbbing sound and smell of hot engines, which had been lovingly tuned for the occasion. All sorts of events ran throughout the day, including the "free-wheel" downhill from Galley Hill, which re-enacted a similar event which took place during the Races between 1902 and 1906 in Bexhill, where cars glided without power from the top of Galley down to the seafront, when obviously the one that travelled the furthest won the competition. We had compatible pairs driving alongside each other, not at breakneck speed but fast enough to be exciting and make enough noise. Some wonderful cars were on show, they just kept on arriving throughout the day from all over the country. The event seemed to have caught the imagination of the motoring world and had suddenly taken on a life of its own. We knew that we had been very lucky, we had got away with using hardly any barriers to speak of, probably not enough First Aiders etc. How different from today with all the Health & Safety and Risk Assessments, Human Rights Act, a minimum £10,000,000 compulsory insurance etc. We made sure that we rectified this situation and meticulously included all of these missing safety elements in the subsequent events. We enjoyed incredible coverage from the media afterwards, and it was proclaimed a highly successful event. The RAC finally acknowledged in 1994 that Bexhill-on-Sea was indeed the Birthplace of British Motoring. Brooklands Motor Museum and Track therefore had to amend their logo to "Home of British Motor Racing", and signs to the three approaches to Bexhill proudly proclaim its place in British Motoring history. 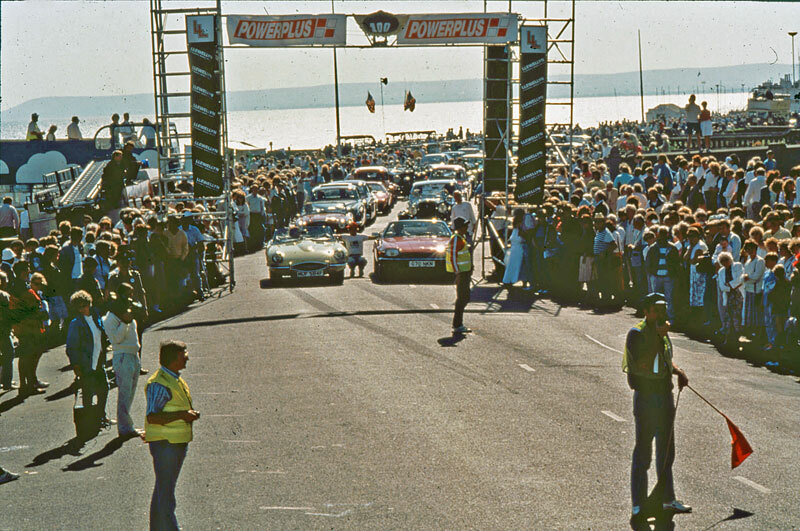 After this first successful event in 1990, the die had been cast and we were committed to think about making the Bexhill 100 an annual event. All of us were very enthusiastic and gave our time for nothing, which was just as well because with no funding, very little sponsorship, and being unable to charge for entry to the show on a public promenade, funds were tight, very tight. We charged vehicle entrants £2, just to cover the cost of postage and paper work. We were very fortunate in 1997 to obtain a 6 year sponsorship deal from locally based national insurance company Hastings Direct which enabled us to be able to keep the Bexhill 100 going long enough to celebrate the 100th Anniversary of the very first motor race in Great Britain at Bexhill-on-Sea in 2002. After this amazing first event, our policy for the Bexhill 100 was that "The Cars are the Stars". We were not a purist event, we accepted Vintage, Veteran, Classic, Military, Custom, Racing and any other vehicle of particular interest providing it was of the necessary standard, they all had to be noteworthy for one reason or another. Our "strap line" for our event was "Keeping History Alive" and I think that says it all. 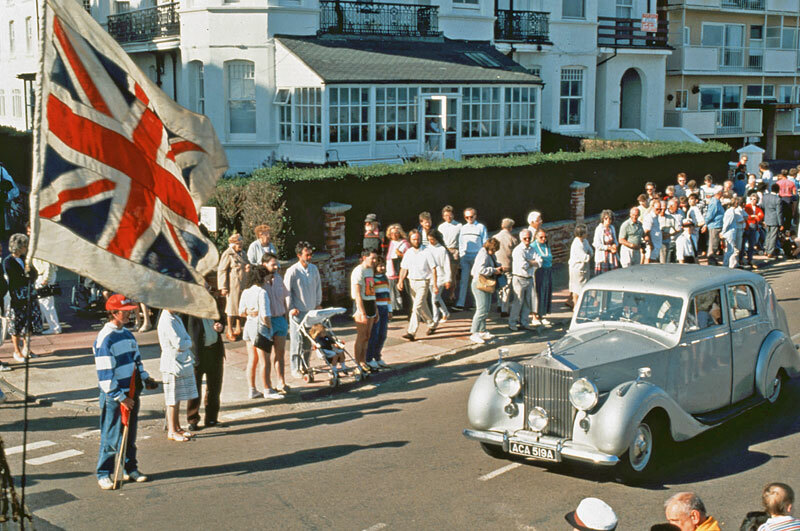 The Bexhill 100 Festival of Motoring continued to grow with each year that passed, attracting crowds of 80,000-100,000 over the festival weekend. We were blessed with so many wonderful helpers and supporters, too many to mention them all. We had almost 100 loyal marshals led by an incredible man, our Chief Marshall Ian Howell, with a wealth of knowledge and experience, his support, skill and aptitude were invaluable, always in control and continually making sure the car entrants knew the timings and the rules and regulations of the track. We had so many enthusiastic and supportive experts, including the indomitable Ron Wanmer, a more knowledgeable commentator would be impossible to imagine, I do not believe there was hardly a car from any era of the thousands that came to the Bexhill 100 for the 13 years that it ran, that he could not talk about with authority and genuine interest. We were supported each year by so many loyal owners of classic, vintage, veteran, commercial, steam and military vehicles, who returned year after year. People like Mr & Mrs Bacon who came religiously every year to the show and to every other event, throughout the years that the Bexhill 100 team organised and they still do now with Bexhill 100 Motoring Club, such loyalty and enthusiasm. There were so many loyal entrants, all of them seemed to be excited and proud to be part of this historic event. Another loyal helper, and there were so many that spring to mind, was Norman Porter, whose helpfulness, willingness, generosity and kindness was amazing. I can still remember him working through the night after one of the events, supplying all the materials himself, repairing the lawns in front of the Sackville after a Double Decker open top bus had got all four wheels stuck in the mud and had to be towed out by tractor. After the first event, my brother Ron Storkey became the festivals official photographer, he spent hours taking pictures of every aspect of the event and thanks to him we have a vast library of photographic memories. 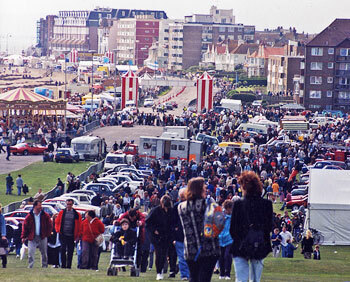 The promenade was always so packed that it was impossible to quickly go to different parts of the show so Ron was constantly being shuttled by helpers on all sorts of different forms of transport to different parts of the show, bearing in mind that the event was spread over a mile of Bexhill's promenade. We were blessed from the start with support from local businesses, such as Russells Renault Garage, Drays Hi-Fi and many more. Their generous support continued throughout the Bexhill 100's 13 year life. Incidentally Louis Russell, the present John Russells grand father, opened the garage and was at the original event in 1902 together with Louis Renault the originator of Renault cars. We were of course very grateful for the generous support of Hastings Direct Insurance Services who sponsored the Bexhill 100 for six years from 1997 until the final event in 2002. The St John Ambulance organisation was formed in Bexhill in 1902 and they had their first headquarters in Russells Garage in London Road. So it was fitting that they were present at the Bexhill 100 Festival. Throughout the life of The Bexhill 100, Mike Dean and The St John Ambulance team, conscientiously supplied excellent First Aid cover to the event. After the first Bexhill 100 event the Council did their sums, and to their horror Derek had spent £14,500 on the Bexhill 100, which was two whole years of the RDC's tourism advertising budget at the time. At the end of the year Derek unfortunately, still with head held high, left the Council under a little bit of a cloud and got a marketing job in the West Country. He did however come back a couple of times in subsequent years to get involved with the Bexhill 100 event. However, with Derek leaving Bexhill, it meant that for the following 12 years I had the unenviable, difficult, stressful but very proud task of being the main organiser of the Bexhill 100 Festival of Motoring, aided by a wonderful, loyal, hard working, talented and enthusiastic team. 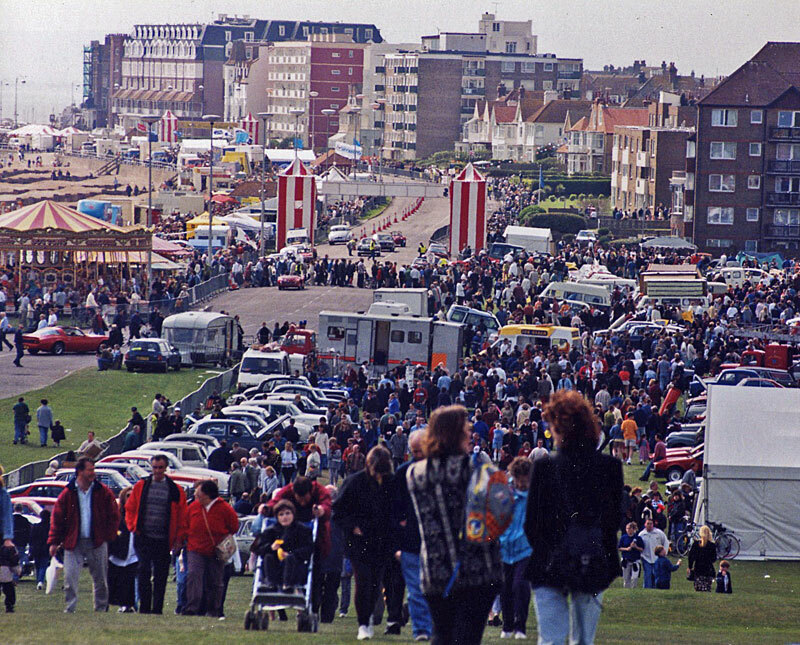 The result of this overspend in 1990 was that the Council never directly helped financially after that first event, although they did generously each year pay for the cleaning contractors to clear the litter etc from the sea-front immediately after the event, for which we were very grateful. The contractors did a superb job and literally hours after the last stand had left, you would not have known that there had been an enormous event on the normally placid Bexhill seafront. 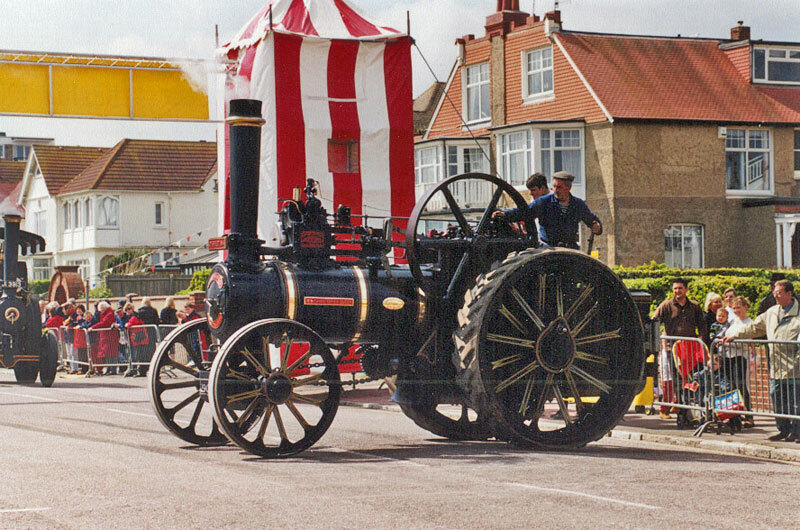 In the final few years of The Bexhill 100 Rother District Council realised the importance of the event to the town and were much more helpful and constructive. 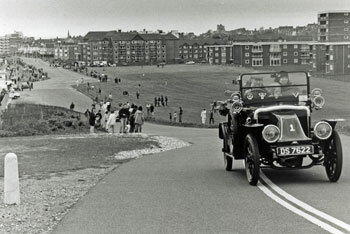 Unfortunately they would not change the Bye-law, although we asked them to do so many times, to allow us to have a "Road Closure" on the promenade and seafront road to enable us to make a small entrance charge, and to give the Bexhill 100 a chance to survive for many, many more years. We were however determined to continue so that we could at least celebrate the Centenary of that very first race meeting in 1902. Shelagh Milligan was only involved in the first show in 1990, but we were very grateful for her valuable input in the inaugural event. Keith Wallace continued for another couple of years and then for the final ten or so years it was Brian Hazell, Ken Pope, Paul Foulkes- Halbard, Malcolm Mitcheson, myself and of course all of the wonderful helpers, marshals, cadets, and the invaluable secretarial and administration support from first of all Tracy Trimmer, then Caroline Tabel, and in the latter years Sue Spice. After the "Festival" had been going for a few years, in order to include and help the retail shops and businesses in the town, we introduced a huge Saturday parade of Vintage and Classic cars, numbering about 100 vehicles which assembled in the De la Warr Car Park on the Saturday morning of the Bexhill 100 weekend. We suffered quite a bit of abuse from some residents for taking over the Eastern end of the car park for a couple of hours, but you cannot please everybody. The cars were on display in the car park for about an hour, entertained by various musicians and the ever present at all of the Festivals, "Charlie the Clown". The vehicles then set off in convoy, lead by an open top bus with local dignitaries on board, and slowly paraded through Bexhill Town Centre to Sidley, Little Common, and Cooden where at the Cooden Beach Hotel all the drivers and the passengers were generously supplied with refreshments, entertainment from a Jazz Quartet and a chance for a "photo shoot". After seven or eight years the Bexhill 100 had become a huge logistical venture which took almost a whole year to organise full time for a very small team, and once one event had finished the next one started, so it became necessary for the sake of continuity and efficiency to pay various members of the organising team, which meant raising more sponsorship and creating more financial pressure. The Bexhill 100 went from strength to strength. 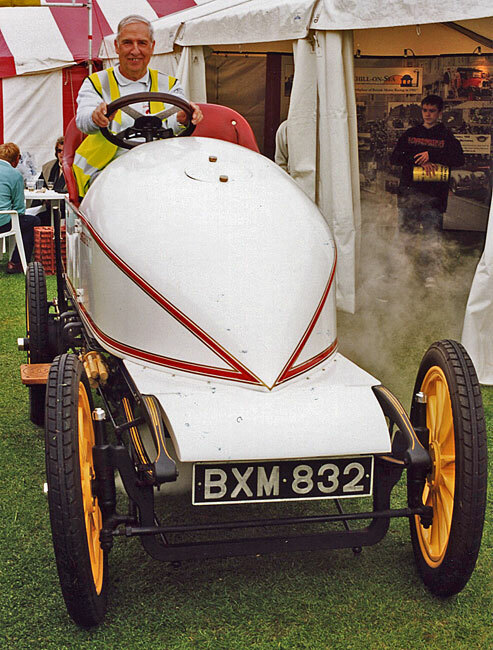 Each year it celebrated different milestones in motoring history and involved various personalities and cars. We had Mike Costin and Keith Duckworth to celebrate their revolutionary Cosworth engine, with examples of their Lotus 49 Cosworth Ford and many others. Frank Nichols, designer of The Elva racing car of the Fifties and Sixties that started life in a workshop here in Bexhill. Raymond Baxter, Stirling Moss and also Lord Montague who unveiled the obelisks in 1994 to mark the beginning and end of the1902 race track on the seafront. The granite obelisks were generously supplied by Ivor Brampton a local councillor and Deputy Lieutenant of East Sussex. 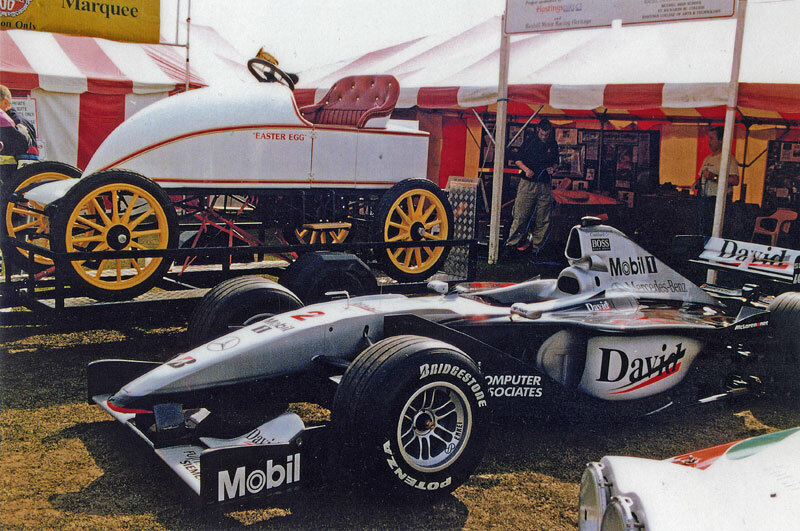 One year the Civil Service Motoring Association supplied the David Coulthard Mclaren Formula 1 car to stand alongside the replica Serpollet, the very first Formula 1 car. The list of wonderful guests and special vehicles is endless. Each year, after that first event, we were very grateful to be supported by the Steam Car of Great Britain who brought so many wonderful cars to the 100, it was so exciting to see them and hear them steaming up and down the seafront at Bexhill, the site of the original race track where the Serpollet "Easter Egg" Steam Car won the first motor race on British soil and gained the British land speed record. In fact one year we held a separate summer event just for the Steam Car Club of Great Britain, with a wonderful display of steam cars opposite the Sackville. We wanted to do something special at the 1999 event, to celebrate the 10th anniversary of the first Bexhill 100 Festival of Motoring. At the time a very talented graphic designer, Richard Thane, was working with us on the Bexhill 100 Souvenir Programme. He had a great interest in all forms of motor racing and during one of our "Head-banging" sessions the idea of starting a Motoring Club was discussed, a way of bringing owners and a huge range of vehicles together in one club. After much deliberation and planning we launched The Bexhill 100 Motoring Club, just prior to the 1999 Bexhill 100 Festival and we advertised it in all of our publicity and literature to prospective car entrants. The Bexhill 100 Motoring Club was born and is still going strong and has a healthy membership thanks to a hard working enthusiastic committee and loyal supportive members. We tried each year of the Bexhill 100 to introduce better attractions, and more dramatic displays, Aerobatic Teams, Parachute Teams dropping on to the beach etc, Wingwalkers etc which by their very nature became more expensive, as did the costs of public safety and insurance. As mentioned earlier in the story, we were unable to charge admission because of a Rother District Council Bye-Law which would not allow us to close the road and the promenade for the event, even though we offered to put barriers parallel and 2 metres away from the promenade rails to enable the few people who use the promenade to still be able to so. We had to rely on the sale of programmes and stand space etc. As the event became more ambitious it also became more expensive and income together with sponsorship never quite covered the cost of the show each year. We managed to keep the event going until the final Bexhill 100 in 2002, the final agreed year of our main sponsor, Hastings Direct. Thanks to their continued sponsorship, we were able to celebrate the Centenary of those first Bexhill Races in 1902, on the sea front, in grand style. 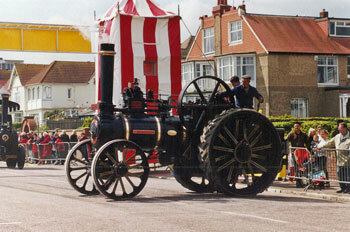 Exhibits included the replica Serpollet Easter Egg, the replica of the Trevithick's 1803 London Steam Carriage, Russ Swift , World Champion at "Parallel Parking", "helicopter displays", a collection of Elvas and much more. There were so many highlights throughout the 13 years of The Bexhill 100 that it would take another article of the same length as the preceding script to do them justice, but there were a few that will stay indelibly imprinted in my mind. Some were amusing and some were scary moments, too many to mention them all. One or two though do stick in my mind. We had various Dragsters performing at the show each year all of them very professional but two of them gave us palpitations. 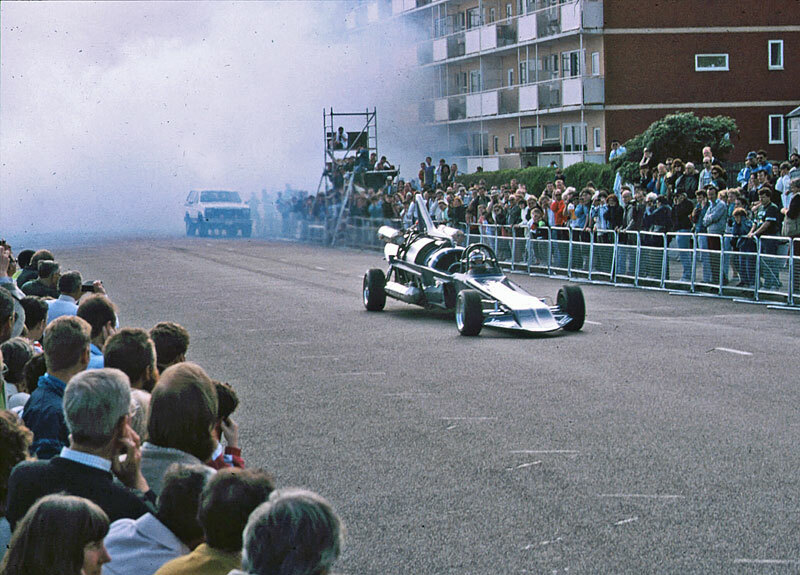 One of them had a top filled fuel system and when it took off there was so much smoke, the dragster and the crowds and the seafront disappeared in this thick black cloud of fog. Suddenly all the "fire alarms" in hundreds of the flats along the seafront started clanging, within 5 minutes we were inundated with Fire Appliances, Ambulances and Emergency Service personnel. It took a bit of explaining, but fortunately when the crews realised what had happened they saw the funny side and there was no harm done. We were all laughing hysterically, and every time we spoke of it we convulsed in fits of laughter. The other dragster in question was powered with a "vampire jet engine", the crew were very meticulous, they swept the road, and made sure that the crowd at the rear of the dragster were at least 50 metres away. There was great anticipation as they started the dragster up, there was this huge roar, and an enormous blast of hot air. Above the noise I heard a scream, an elderly lady, who had been standing behind the dragster with her miniature dog, shouted as her dog was blown off its feet up high into the air and then disappeared over a hedge. We all ran to the spot fearing the worst, but as luck would have it the dog was none the worse for his flying experience. We were so lucky and we breathed a huge sigh of relief. We got a bit of a dressing down though from the respective Council Officials. In the evening we all talked about it and although we laughed hysterically, we knew that we had been very, very lucky. Although, sadly, The Bexhill 100 Festival of Motoring is no longer held on the seafront at Bexhill-on-Sea on the Bank Holiday Weekend at least the committee and members of the "Bexhill 100 Motoring Club" now have their own compact but very interesting static Classic and Custom Car Show in "The Polegrove Recreation Ground" on the August Bank Holiday weekend. The club helps to continue to promote and keep alive Bexhill's unique claim of being The Birthplace of British Motor Racing, whilst at the same time raising large sums of money for local charities. The final Bexhill 100 in 2002 was amazing, and a fitting tribute, not only to those early racers but to all of the those people, the marshals, the helpers, the Emergency Services, the stall holders, the caterers, the sponsors, the entertainers, the fairground, the owners of all those wonderful vehicles who had made The Bexhill 100 Motoring Festival successful and unique for those 13 years and of course the public who supported it every year, Rother District Council for their tolerance and support and the seafront residents who were entertained but inconvenienced each year on the May Bank Holiday. We thank all of them for their enthusiasm, their dedication, their support and for all the memories they have left us with, it was truly a unique event and a fitting tribute to those early motoring pioneers. There were so many people who became involved with and contributed to the Bexhill 100 Festival, not necessarily with finance but with time, enthusiasm, excitement and passion over the life of the festival, individuals, families, companies and small businesses, too many to name but I hope that you accept my heartfelt thanks and gratitude, without you it may not have happened in the first place and it would certainly not have continued for thirteen years, or been the huge success that it proved to be, promoting Bexhill-on-Sea as the Birthplace of British Motor Racing. Writing this article has brought memories flooding back, but obviously I have not been able to include everything that happened in that first year. However if any of you that were either involved or attended as an entrant or a spectator at that first event in 1990 and you feel that I have missed someone who was really memorable or important or something that happened at the first event that I should have mentioned, please feel free to contact me. There were so many amusing and interesting things that happened during the life of the event that it would take another article of the same size to catalogue them, maybe I will attempt that to write about them one day. Our dear friend and colleague, Paul Foulkes-Halbard sadly passed away in 2004. He was such a larger than life, eccentric character and he is sadly missed by all that knew him, everyone involved with the Bexhill 100 and of course by his family. Pauls' son Carl continues to run Filching Manor, the Motor Museum and the very popular Campbell Go- Kart track. Paul was renowned for his bad time keeping and I was often embarrassed when I had organised a photo shoot with a TV company and we were all standing around for him to eventually arrive an hour late. That was Paul. He was a real character, I can still remember Paul coming to one of our early Bexhill 100 meetings with one of the very first mobile phones, it was as big as 3 house bricks and weighed about as much, he kept it for a few quite a few years. He loved driving his wonderful blue racing Bugatti, and his beautiful white vintage Mercedes racer at great speed down Bexhill seafront, wearing goggles and a white leather aviators helmet. He was a one off, a great character. Also sadly David Blake passed away in 2005. He was a true gentleman, polite and genuine, a great supporter of Bexhill-on-Sea and the De la Warr Pavilion. He first came to Bexhill as the Stage Manager of the De la Warr where he later met his wife to be, Janice. She came to Bexhill to appear as a dancer at the Pavilion in a Summer Show, "Starlight Rendevous". David eventually became Rother's Director of Tourism, Head of Parks and Gardens and Manager of the De la Warr Pavilion, positions which he jointly held successfully for a number of years. Janice went on to own and run, for over 35 years, the most successful dance school the area has ever known. Over the years The Janice Blake School of Dancing taught and nurtured a wealth of talented youngsters, many of whom went on to make a successful career in show business. Janice retired in 2007. 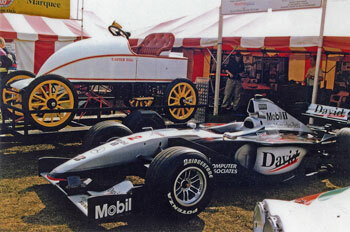 It is probably true to say that if David Blake had not gone out on a limb and allowed Derek to use Rother funds as seed corn money for the First Bexhill 100, then it would probably not have been so successful or exciting, and who knows then whether it would have continued for a second year let alone for another 12 years. 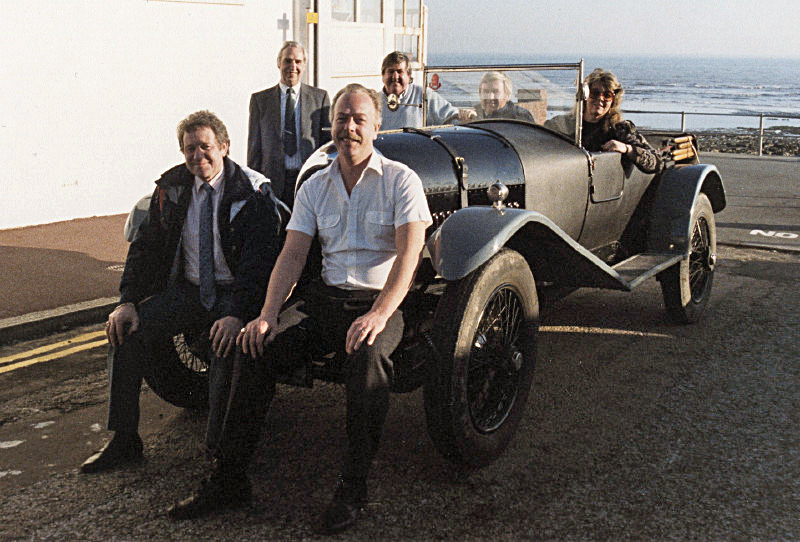 This article is dedicated to Brian Hazell, who was highly respected by all of his business associates, a very dear friend, a true gentleman and a person who was passionate about Bexhill and its history and who had an idea that Bexhill was the first town in Britain to hold a Motor Race meeting. He was proved to be correct in 1994. 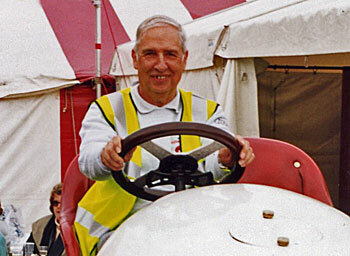 Brian sadly passed away in May 2009 and he is sadly missed by everyone who was privileged enough to have known him. The signs on the approach roads to Bexhill stand as a tribute to him and his love of Bexhill, and his wonderful photographs are a legacy of his passion for the town and its historical past.